Shakeenah is our hardworking, hardstudying MBBS trainee doctor from Sri Lanka. 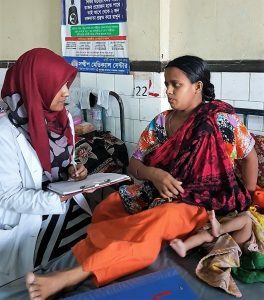 She is beginning her fourth year at Chittagong University in Bangladesh, where she has ambitious plans to specialise in Gynaecology. 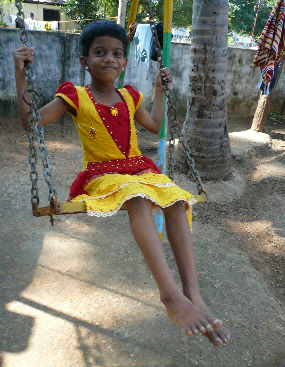 Shakeenah is the middle child of three in a poor family in Sri Lanka. 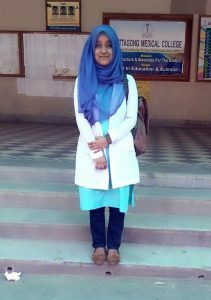 She has excelled at school and passed into Chittagong Medical College, Bangladesh to study for MBBS. 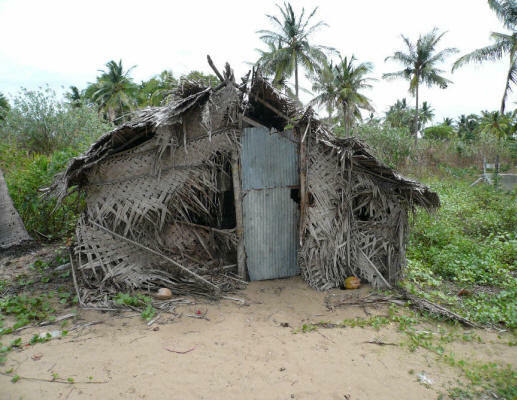 The Sri Lankan Government pays her tuition fees and her Father has managed to find $130 (£100) per month to pay for her accommodation, food, and living expenses for the last two years. Mother has bad arthritis and the family are struggling to find this essential money to keep her at the College for another (minimum) two years. Lankan Muslim Community, but also because the College is close to the massive recent influx of Rohingya refugees (mainly Muslim) driven out of Myanmar. Shakeenah and the other training doctors are likely to play a valuable part in treating these homeless refugees in the next months. 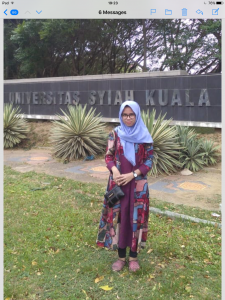 Zahra Astriani is 18 yrs old and has long desired to become a vet and pursue her love of animals. Star Action is conscious that animals are not always treated well in the Developing World and an addition to the limited supply of veterinary practicioners will be a valuable asset to Indonesia. 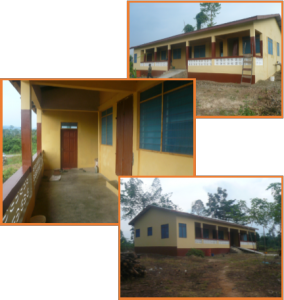 With much capable help from our Star Action stalwarts, Hamida and Frederick Bote-Kwame, Star Action has decided to lease the Youth Training Building on the outskirts of Asiakwa to a school of 90 pupils. The accompanying land will be used as playground and sports field. The owner and Headteacher, Samuel Asamoah is also Pastor of a local Christian Church in the town. He runs the school on a ‘shoestring’ and his ambitions for the children are similar to ours at our children’s homes and schools. He already numbers amongst his pupils many who can only afford to pay half fees, and he has agreed to include more from poor families on free scholarships. This will be helped by Star Action charging a rental of 1 Ghana Cedi per annum (about 17 pence Sterling). Hyper-efficient Hamida is finalising the legalities as I write, and these will include representation on the School’s Board of Management by herself and another good friend of Star Action, a retired International Architect who is a respected Elder of Asiakwa and who will safeguard our interests and closely monitor the quality of the children’s education. Thanks to the generosity of our supporters, we have been able to send help to the earthquake-damaged Panchakoshi School in Pokhara. 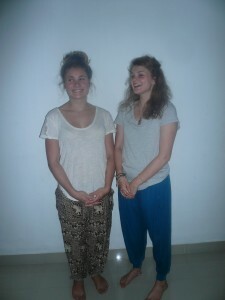 See our Nepal page for more details. The amazing good news is that we now have 150+ children benefiting from our growing Sinhala Teaching Project. From a small beginning—just one lady, Amudha in Lal’s village of Kayankerny teaching a few children in her home (she now has an extension which was crowded with over 40 children on our recent visit)—we have 6 more teachers in other villages, the latest being Mala in Kudamumakal, who teaches in the Nursery School (earlier request for playground equipment.) We found that she is fluent in Sinhala and very willing to have the extra job of after school Sinhala classes and a class of older children. The Buddhist school at Mylankarachai we visited last February with Richard and Sasees is going from strength to strength, with 60 children attending. They are divided into two groups with the younger ones with two teachers, Kanthilatha and Sulakshmi, and the older children with formidable Sisili Perera—a very well organised older lady who was outspoken in her requests for books, pens and other teaching material! 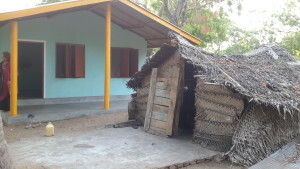 All our teachers are paid 5,000 rupees a month (£25) and are happy that their salaries are secure (quite unlike government paid teachers in this area who find that often their salaries remain unpaid for many months). We particularly love this Buddhist school which is right next to the Buddhist Temple and there is a most beautiful aura of peace and healing pervading this whole village. 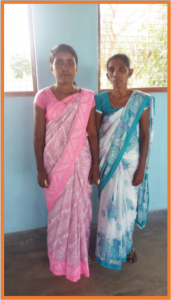 Nirojini (see photo on page 1) has a new group along the coast in Ooriankadu and Rokshana is now using her own home to teach after school Sinhala in Mankerni. 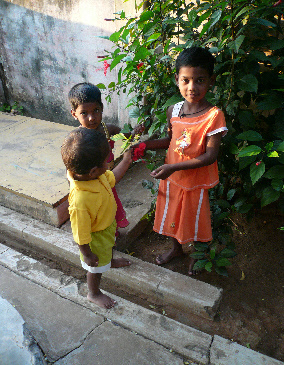 Rokshana also has two assistants, who help the 42 children of varied ages with problem homework from school. It is so good to realise that all these children —and many more to come—will benefit from the opportunity to learn the main language of their country, not just Tamil, which is spoken only in the North and Eastern Provinces and severely limits future job opportunities. Jenny travelled to Sri Lanka with her son, Michael, this year as Stuart’s wife, Bobby, was very sadly taken ill and has subsequently died. Our thoughts are with Stuart and his family. 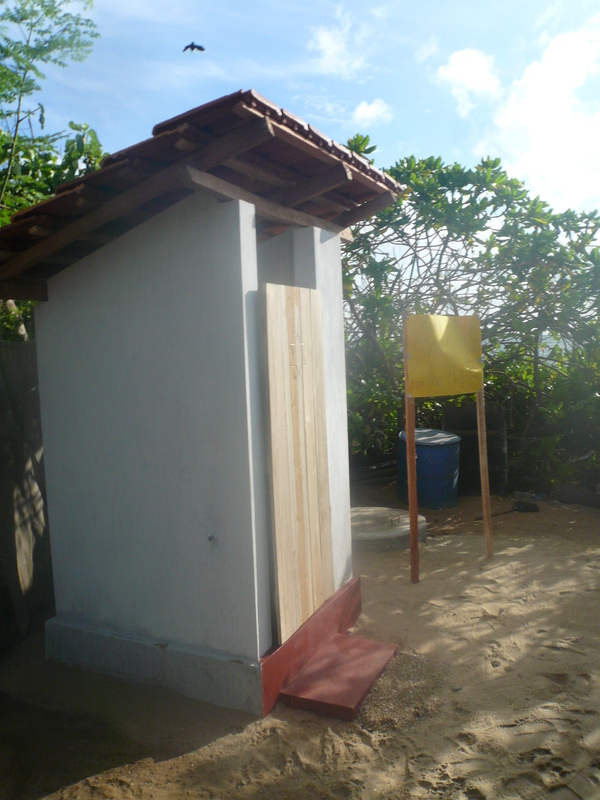 Star Action continues to transform the lives of poor communities in Eastern Sri Lanka with agricultural projects such as rice, groundnut and chicken production. Our focus on education also continues apace, as Rakshana takes on the task of teaching children the national language of Sinhala in Mankerny – this is particularly important for the Tamil speaking children who might otherwise be unable to benefit from the national education provided. 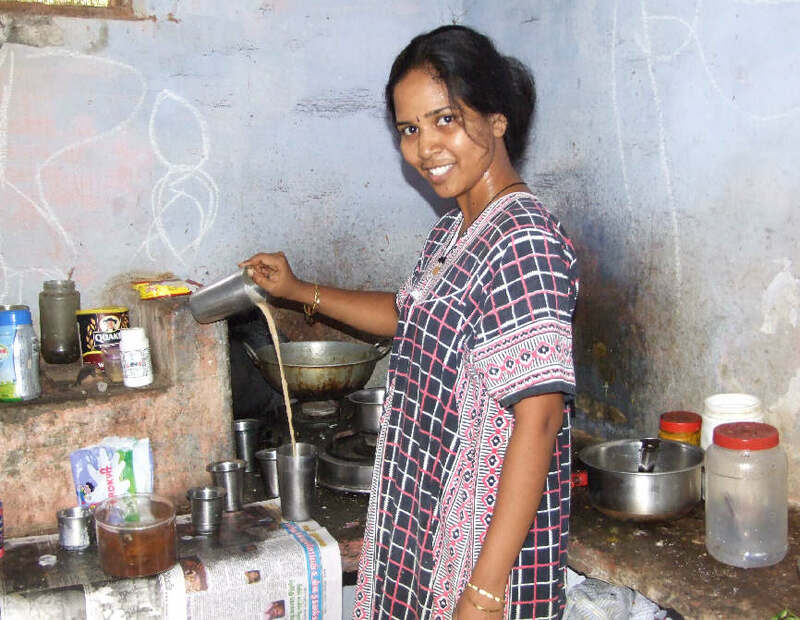 Others who have given much over the years to support the education of children here – such as Sneeha – are moving on to train in nursing with Star Action’s support and blessing. In India, Richard and Sasees continue to provide a refuge for children. Our most recent recruits are a small group from the desperately poor Cardomom Hills region, who it is hoped will have an opportunity to break the poverty trap of poorly paid manual labour in the tea plantations that might otherwise be their meagre inheritance. The life-changing impact that our Brighter Life home (as we are now calling the Save the Babies orphanage) has, can be seen in Marcus, one of our first babies, who is now studying for his A Levels in Maths, Physics and Chemistry. Star Action has also been able to be of assistance to more people in Nepal: we have helped by stocking the library of the Haven on Earth Orphanage that Jenny opened in 2014 and, through the generosity of one supporter, have been able to rebuild the home of a family that was destroyed in last year’s earthquake. It’s been quiet on the blog but we have been busy working behind the scenes! This has been another year of good progress with our projects to help individuals and families in severe poverty and to contribute to the education of the next generation. One or more of the Trustees was able to visit India and Sri Lanka during the summer and we were able to steer assistance in Nepal, after their two devastating earthquakes, from a base in Qatar. Christmas is nearly here again. 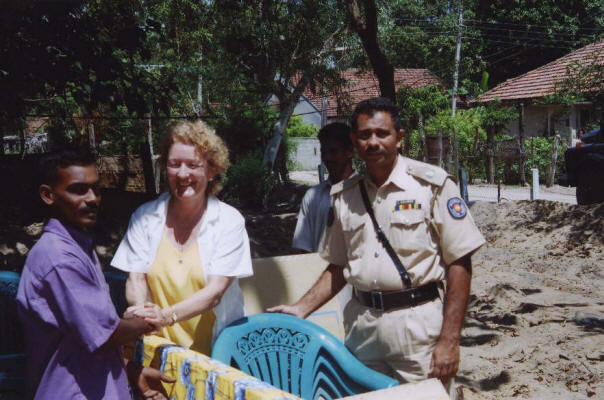 STAR ACTION Christmas gifts help you find the answer to ‘what do I give…?’ but also enable us to give more greatly needed support to really deprived children and sad families in Sri Lanka and India. Also see our latest Newsletter for news from Nepal and a possible new project to help the Syrian refugees trying to live in Turkey. We thank you so much for all your support throughout 2015 and send warm greeting for Christmas and the New Year ahead. Thank you for all your interest and support of our Star Action work. It has been a busy year for us here at Star Action; please browse through our site or download the newsletter from the sidebar for updates on all our projects and news of new ones too—including our new friends in Nepal. We have had a another successful year running our Christmas gift scheme and hope you have had a wonderful Christmas and a happy start to 2015. Whilst you have been enduring almost constant rain in England and Northern Europe this winter, Jenny and I have spent 3 weeks in Sri Lanka and India, both of which would have been glad of some of the water. We shared the delight of our 27 strong Indian family at their new permanent home in Tamil Nadu and briefly met the first two (gap-year) students who had been staying to learn about India and to help the children. 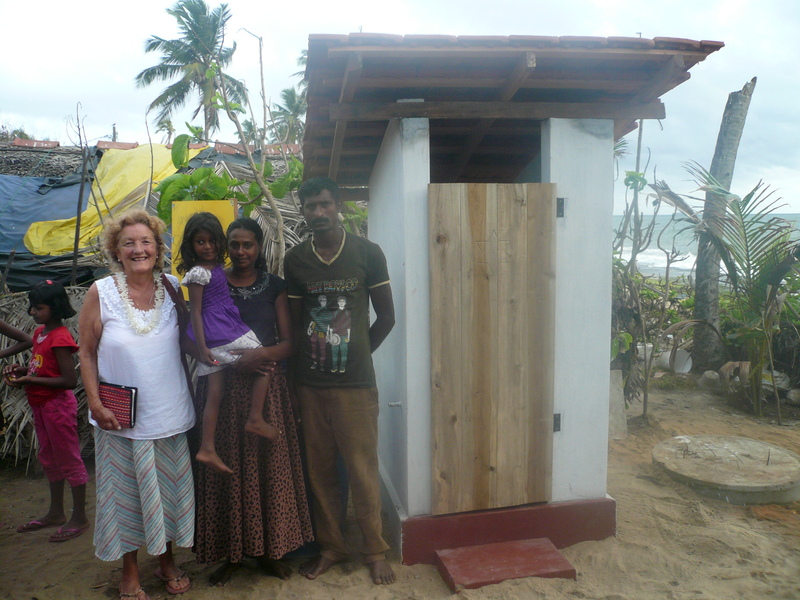 In Sri Lanka we met Vijayashanthi who, through your generosity, has almost fully recovered from her heart operation. We saw the joy on the faces of many family members at the prospect of a new set of clothes (Christmas 2013 appeal), and arranged for two refurbished houses and a power supply to a third. 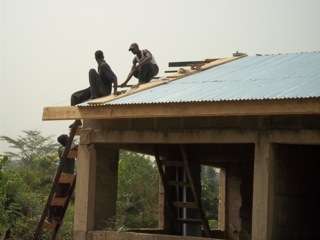 The Youth Training Centre in Ghana has also enjoyed a generous donation enabling a constant water supply to the building. Christmas Gift scheme – New for 2013! This year sees the launch of our Christmas Gift scheme – a choice of gifts that can make a real difference to our friends in Sri Lanka. Visit the Christmas Gift Page for more details.